Time is an American weekly news magazine published in New York City. It was founded in 1923 and for decades was dominated by Henry Luce, who built a highly profitable stable of magazines. Time (styled within the magazine as TIME) is an American weekly news magazine published in New York City. 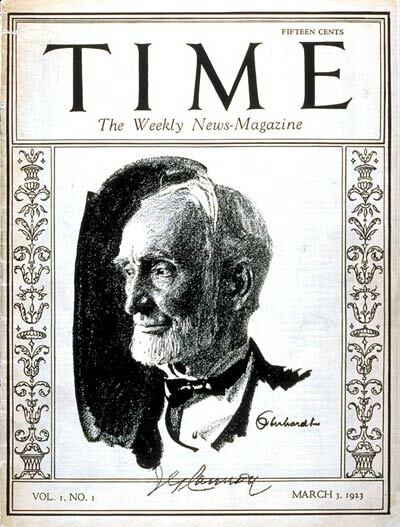 It was founded in 1923 and for decades was dominated by Henry Luce, who built a highly profitable stable of magazines. A European edition (Time Europe, formerly known as Time Atlantic) is published in London and also covers the Middle East, Africa and, since 2003, Latin America. An Asian edition (Time Asia) is based in Hong Kong. The South Pacific edition, which covers Australia, New Zealand and the Pacific Islands, is based in Sydney, Australia. In December 2008, Time discontinued publishing a Canadian advertiser edition. Time has the world's largest circulation for a weekly news magazine, and has a readership of 26 million, 20 million of which are based in the United States. As of 2012, it had a circulation of 3.3 million making it the eleventh most circulated magazine in the United States reception room circuit, and the second most circulated weekly behind People. As of 2015, its circulation was 3,036,602. Richard Stengel was the managing editor from May 2006 to October 2013, when he joined the U.S. State Department. Nancy Gibbs has been the managing editor since October 2013.